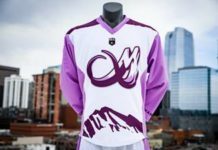 A ‘Sock-Trick’ is a term which originated at Pepsi Center for a player who scores six goals in a single game in indoor lacrosse, completing the feat in the third quarter with just 13 seconds left to tie the game at 13. The Mammoth started the first quarter with a 3-0 lead by 6:04, scoring two goals on power plays. 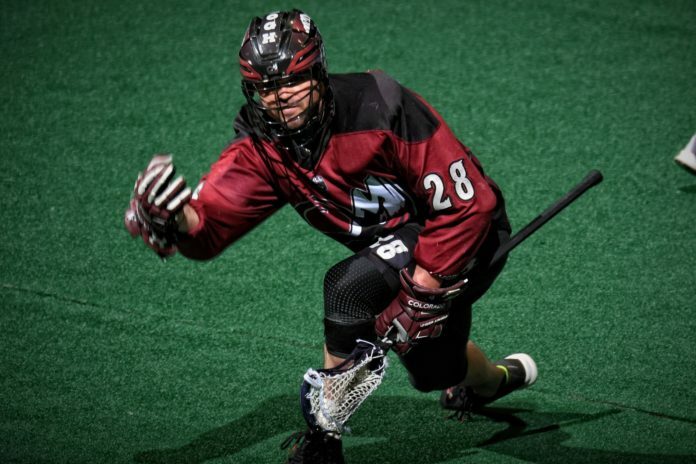 At the beginning of second quarter, the Mammoth’s offense remained dominant. By 4:54, Colorado led 9-4 and Rochester relieved goaltender Matt Vinc with goaltender Angus Goodleaf. 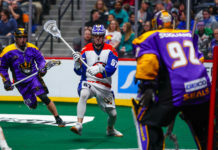 However the tide turned, as the Knighthawks dominated the turf, scoring four straight goals – two in transition – to tie the game 10-10, at 13:20. Colorado relieved goaltender Dillon Ward with goaltender Steve Fryer at that point. The third quarter saw Rochester take their first lead of the night. With three straight goals by 9:44, the Knighthawks led 13-11. But in the final minutes of the quarter, the Mammoth answered back. McLaughlin scored his second goal of the night at 13:43, then, with 0:13 seconds left in the quarter, Keogh scored his sixth. With a goal that would have been sock-trick completion in The Loud House, Keogh’s goal knotted the game at 13-13. Keogh scored once more in the fourth quarter. His seventh goal on a power play at 1:14, gave the Mammoth a one-goal lead. But from there, Goodleaf barred the Mammoth’s offense from Rochester’s net, making 11 saves as Rochester launched a three-goal crusade to win the game 16-14. At the end of the game, Keogh came away with 9 points total (7G, 2A). Another Mammoth player with incredible moments Saturday night was goaltender Steve Fryer who relieved Dillon Ward with 1:40 left in the first half. Fryer saved 32 out of 38 shots. 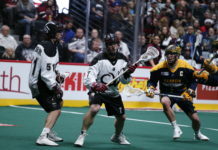 With back-to-back games behind them, the Mammoth’s focus is now on the Saskatchewan Rush. The Mammoth will meet the West division-leading team on Saturday, April 7, in the SaskTel Center. The Mammoth return home on April 14th to face the New England Black Wolves.